The Miami Herald reports the Key West City Commission approved the measure 7-0 on Tuesday night. Commissioners now must review the ordinance a second time and pass it again on Feb. 5 before it can become law. It would ban products containing oxybenzone and octinoxate. Some studies have shown that the chemicals encourage coral bleaching. 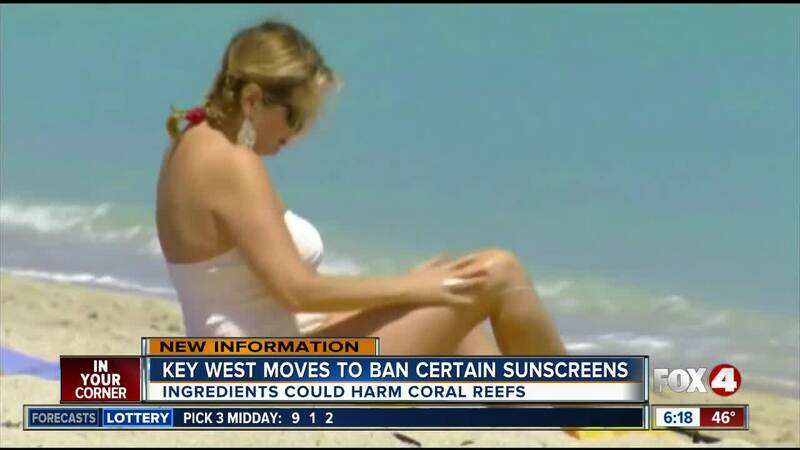 KEY WEST, Fla. (AP) - Officials in Key West took the initial steps toward banning the sale of sunscreens containing two ingredients that could be harmful to coral reefs. Nearly 100 people turned out for the discussion, with 50 signing up to speak. They included dermatologists, boat captains and school children. Commissioner Jimmy Weekley said people could still get a prescription for the sunscreens. Last year, Hawaii banned the sale or distribution of sunscreens containing the ingredients beginning in 2021.